I often get inquiries from people interested in designer fabric pricing, which typically ranges from $60 per yard all the way up to $175 per yard. Most people are a little surprised at the high pricing and opt to search for something more affordable. Although I have wholesale accounts with many of the top fabric manufacturers, I am constantly searching for great fabric deals to share with my clients and for myself! A few sites I visit from time to time are Heather Bailey Store, Calico Corners and Fabric.com. I've pulled together some of my favorites to share with you. Introducing new fabric into a space is an easy way to update and refresh your look - add new accent pillows, re-cover dining chair seats, hang bold-patterned drapery panels, add some color to your kitchen table with a vintage inspired tablecloth...the list goes on and on! 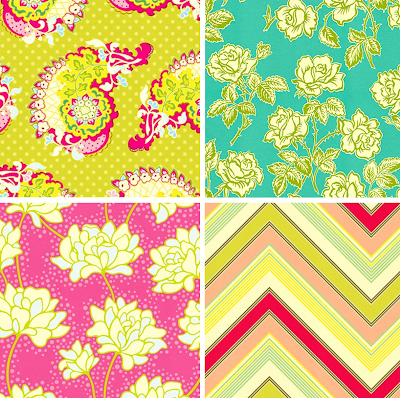 I love fabrics and these are fun, fresh finds! Thanks for all the great fabric links! 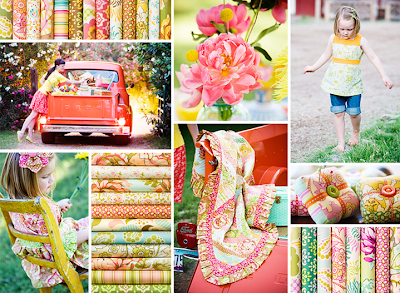 Great fabric picks...and that photo has me absolutely smitten!!! That last green damask, I'm looking for in a pink, to do my own version of a magnet board I saw at Horchow. I found a fabric place online yesterday where it was $15.00 a yard and I only need 1 yard. I'll probably keep looking, but at least I know of one source. Love the drapes in that first picture! I love Heather Bailey fabrics. My daughter and I keep her in business. LOL! Beautiful and colourful fabrics! I love them all!! Wow, what amazing cheerful colors! I love the fabrics! Thanks for the sources. 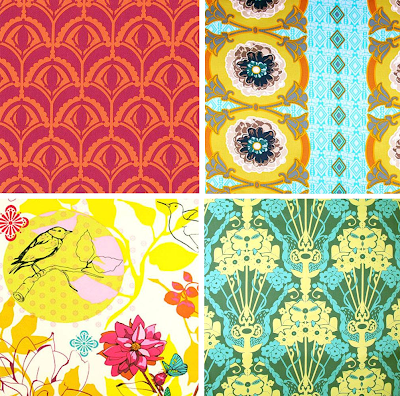 these are wonderful fabrics! thanks for sharing them!!! 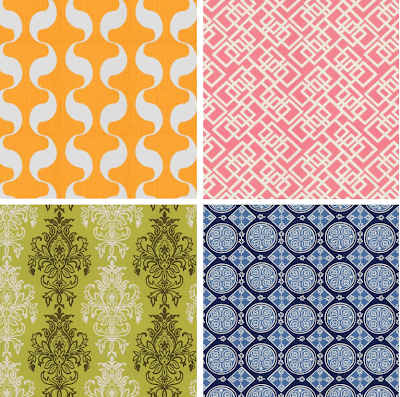 These patterns are beyond gorgeous...especially the way they're grouped together here. Love! GREAT suggestions! Pindler and Pindler also has some fabulous fabrics at affordable prices! have you ever seen wallpaper with a mountain scene of Aspen or Birch tress? I saw it in a magazine a few years ago and absolutely loved it. any leads would be much appreciated! Great fabrics. Another site I came across the other day was http://www.thefabricco.com I put a call into them and they have 2 brick and mortar stores in St. Louis. I didnt see what I was looking for online but I gave them a call and they tracked it down for me. Good People.